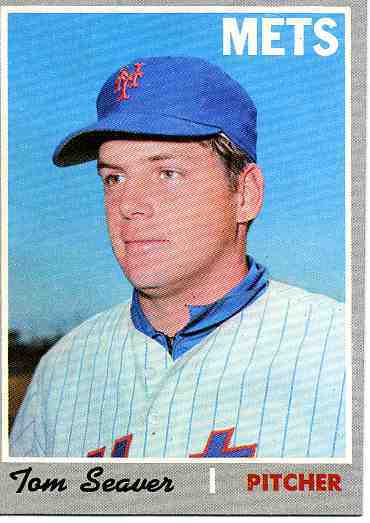 Tom Seaver started pitching for the New York Mets back in 1967 and was 16-13 as a rookie, with a sterling 2.76 ERA. In 1969 he played a major role in the Mets winning their first-ever Baseball World Championship, compiling a 25-7 record with a stingy 2.21 earned run average. His 25 wins were the highest total of any major leaguer, and his winning percentage of .781 led the NL, while his 2.21 ERA was 4th best. Tom Seaver pitched 7-innings and won the 1969 Opening Game of the NL Championship Series with a win of 9-5 over the Atlanta Braves. In the 1969 World Series versus the Baltimore Orioles, Tom Seaver started and lost Game 1 by the score of 4-1, then pitched a complete Game 4 Mets win 2-1, besting Orioles' starter Mike Cuellar. Tom Seaver won at least 20 games 4 times and 12 times reached the 15 win mark during his brilliant career. Tom Seaver posted a 311-205 record and was elected to the Baseball Hall of Fame in 1992. Charlie Puleo was an up-and-coming and highly rated as a starting pitcher for the New York Mets. He posted a 9-9 record with a solid 4.47 earned run average as a 27-year-old rookie All-Star in 1982. That season he started 24 games, tossed his first complete game shutout and also came on in relief in eight other games. Then... on December 16, 1982 he was traded for an aging Tom Seaver. Using a fastball in the lower 90s, Charlie Puleo fashioned a 6-12 record in his first season in Cincinnati. After injuries slowed his pitching, in June of 1985 Charlie Puleo was sold to Atlanta. Lloyd McClenden played in the minors seven years, prior to starting the 1987 season on the major league roster of the Cincinnati Reds. During his 8 year major league career, Lloyd McClendon played mainly as a catcher, an outfielder plus first base and third base. He was traded to the Cubs prior to the 1989 season. For the Chicago team he reached personal high in stats - .286 in 259 at bats, 12 doubles and 12 homers in 92 games. Jason Felice had a fine minor league career and never played in the majors. Height / Weight: 6' 1" / 206 lbs.